I pulled out my custom made MAC palette the other day and realized just how great of an assortment I had created and thought I would share with all of you. Many of you may not know but I worked in cosmetics many years ago, and MAC was one of the first brands I worked for as a makeup artist. I used to freelance on the side doing weddings, etc and I needed to have a basic palette that I could just throw in my kit to create any look. At the time, I was lucky to work with so many amazing artists at the store and they helped me build this palette so that it could work in a variety of situations. I believe MAC still has this custom palette program, and I highly recommend it. 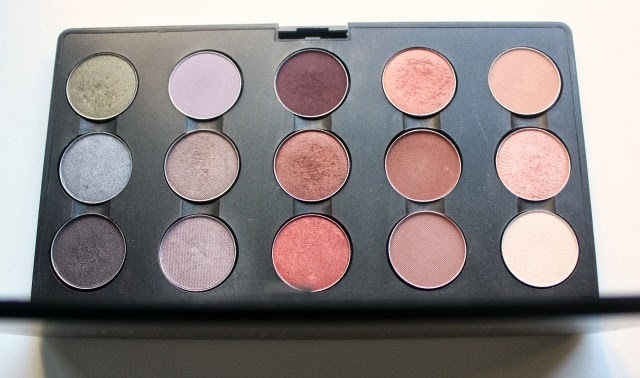 I have swatched the entire palette below to get a closer look at the colors. I do have a few other favorite shades that I add to the mix which don't fit in the palette, such as Embark, Naked Lunch, Wedge, Carbon and Contrast. But in a pinch the above palette will work for just about any look I could ever need to create - subtle, natural, smoky, colorful or dramatic. Any colors you love that I have forgotten? I can't help but love Vex. Did you ever use that one? Now I need Haux!